The last few months we’ve been working on projects that make everything about the Halloo user experience better. We’re excited to share changes designed to provide you with a better service! New ways to understand customers. 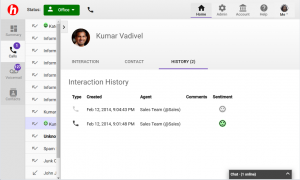 Teams can now see customer interactions in one place, understand historical notes, and see customer sentiment changes. Updated contact interaction history. This feature pulls together calls, voicemails, and faxes. Soon it will also include SMS and email so that you can really get a full picture of a contact’s interaction history. These changes are laying the groundwork for even more substantial and impactful features. We want Halloo to be your central tool for serving your customers better and getting your sales and support teams on the same page. We’ll be unveiling these new additions in our upcoming newsletters. Stay tuned! This entry was posted in Customer Relationship Management, Halloo by Heather. Bookmark the permalink.